South Florida's No. 1 homebuilder Lennar will break ground at its newest resort-style community located in the heart of Palm Beach County on Thursday, February 15. The homebuilder will unveil details to the media at this upcoming ceremony, featuring appearances from elected officials and company representatives. 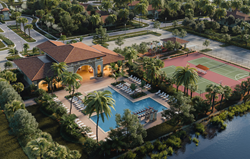 WHAT: Media preview and interview opportunities at the groundbreaking event for BellaSera, Lennar's newest gated, lakefront community of executive and estate homes nestled upon peninsulas in Royal Palm Beach. The event will include a ceremonial groundbreaking and ribbon cutting, and speeches by local dignitaries and Lennar representatives. WHO: Royal Palm Beach Mayor Fred Pinto, Vice Mayor Richard Valuntas, Royal Palm Beach Councilman Jeff Hmara and Councilwoman Selena Smith, and Lennar's Palm Atlantic Division President and Director of Sales. Credentialed media are invited to get an exclusive first look at one of Palm Beach County's most sought-after new home communities. Now selling, the exclusive BellaSera features elegant home collections offering 1,985 to 3,597 total sq. ft. of living space, priced from the $400s. BellaSera will offer a wide array of resort-style amenities on-site, including a clubhouse with a state-of-the-art fitness center, a swimming pool and spa, basketball and tennis courts, a tot lot and much more. Additional details will be revealed at the groundbreaking event. Media interested in attending should R.S.V.P. to Pamela Armstrong at pamela(at)redbanyan(dot)com or 954-379-2115 x3.